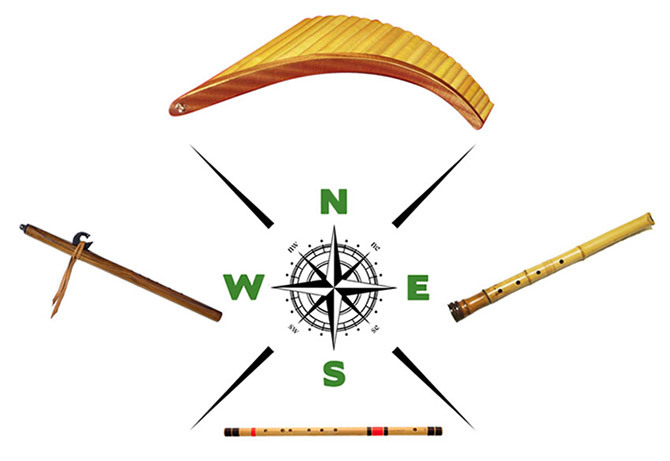 PLEASE CLICK ABOVE ON EACH FLUTE TO START ON YOUR OWN WORLD FLUTE ADVENTURE! Each of the subject area tabs below will take you to a different sub-menu. The information that I will share with you here about these four unique world flutes is at once practical and relevant as well as frank and candid. Wherever possible, I will try to present this information to you in an experiential manner, as I lived it and encountered it over a lifetime of making and playing world flutes. Whether your interest is primarily in making and crafting world flutes, or in playing them as a performer, or simply as an amateur who wants to relax, unwind and plumb the deeper sonic aspects of your being, it’s all here, in one great website! This website is dedicated to my beloved father, David L. Osborn, for a very special reason: He was the one who got me started on my great world flute adventure. My mother was the more musically inclined of my two parents; she had a good voice, and sang in a number of choirs. My father, on the other hand, couldn’t carry a tune to save his life! But one thing he could do was blow on beer bottles – and when I was only four years old, he taught me how to get virtually every sound possible out of an empty beer bottle, overblowing on it to get all the overtones or partials. After that, playing flutes was something that came naturally to me, as they say that whatever you learn that early on in life stays with you forever, and can never be taken from you. I don’t know if you believe in reincarnation and past lives, but I have definitely had experiences playing world flutes that have led me to believe that I have been a flutist in many past lifetimes – and my dad was merely the one who initiated me as a flutist in this life. My father was a career diplomat and ambassador, and his work took us all over the world as a family. I spent many of my formative years, which were very crucial for me in my musical development, in Japan – in fact, I was born there, in Tokyo. I was naturally drawn to the flute, and taught myself to play the silver flute well enough to play it in my high school’s concert band. 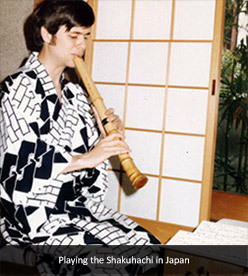 It was also in high school that I got started on the Shakuhachi when my servants gave me a cheap Shakuhachi as a Christmas present. Heck – right down the hill from where we lived was a big bamboo warehouse, and the temptation to go down there to buy some bamboo and start tinkering with it to make flutes was absolutely irresistible. I remember the very first bamboo flute I made – it was an open, end-blown flute like the Shakuhachi, but it was of my own spontaneous and original design. I remember that I had a particularly ingenious solution for finding out where to put the finger holes: I got a bucket full of water and put the foot or lower end of the flute right down on the water’s surface, so a seal was formed, then I played the note that resulted; then, I started sliding the flute deeper into the water, bit by bit, until its pitch rose by a full step, and marked the spot. That’s where I put the first finger hole, to produce the “Re” to the fundamental “Do” – and then I extrapolated or “guesstimated” the subsequent finger hole positions from there. After I had taken up the flute, my dad took me aside one evening and confided to me that he had always loved the soothing, peaceful sound of the flute, a sound that was so close to Nature. He also confided to me that, if he had been gifted with musical ability, he would certainly have decided to take up the flute like I did. Everyone loved my dad, and my sister once remarked, after my father’s passing, that he was “everyone’s favorite person”. Dad had a deep, abiding love for learning all he could about other nations, peoples and cultures – he was a lifelong student of Life. 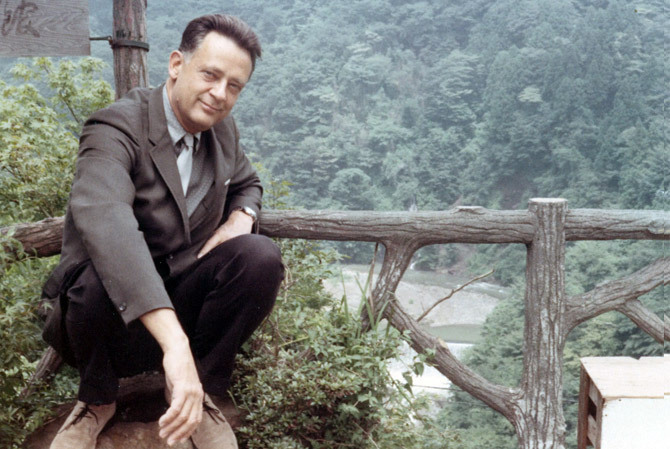 Visiting Japanese dignitaries would often tell us how my father really connected with the “kokoro” or heart and soul of Japanese life and culture. Indeed, that was dad’s way – he was a bridge builder, and a lover of life, and in this, I have tried my best to follow his inspiration and example. It is with great love and respect that I dedicate this website to the great guy who started it all – my dear, beloved father, David L. Osborn. 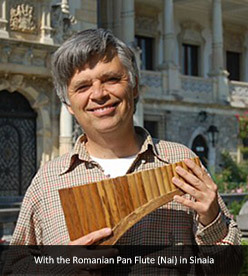 PLEASE CLICK BELOW TO START ON YOUR OWN WORLD FLUTE ADVENTURE! QUESTIONS, COMMENTS AND FEEDBACK WELCOME! Copyright @ by David Osborn. All rights reserved.